Live Mail Password Decryptor is the FREE software to instantly recover all your Email Passwords from Windows Live Mail. Windows Live Mail (part of Windows Essentials) is a popular Email Client application and works on Windows 7, Windows Server 2008 R2 & Windows 8 platforms only. You can also backup the recovered password list to HTML/TEXT/XML/CSV file. Launch it on your system after installation. Now click on 'Start Recovery' button. It will automatically discover your Windows Live Mail Profile location & decrypt all the saved Email Passwords as shown in the screenshot below. 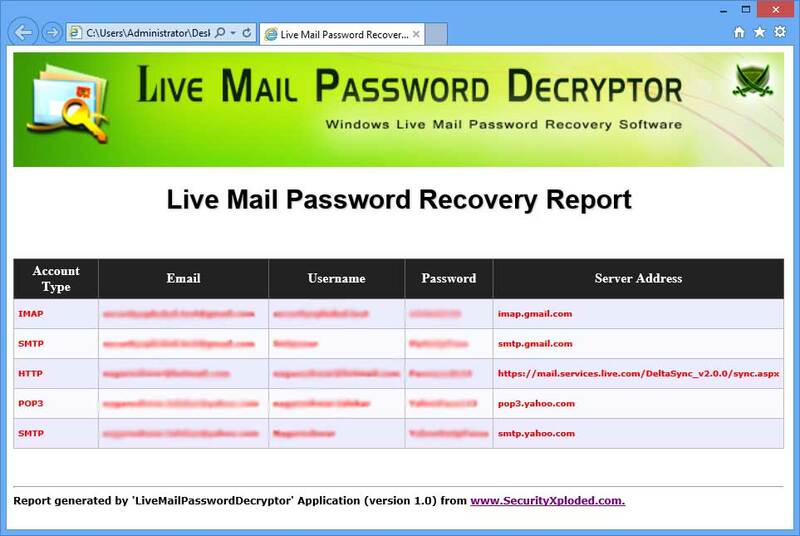 Finally you can backup the recovered password list to HTML/TEXT/XML/CSV file by clicking on 'Export' button and then select the type of file from the drop down box of 'Save File Dialog'..
Screenshot 2: Live Mail account password list in HTML format generated by LiveMailPasswordDecryptor. 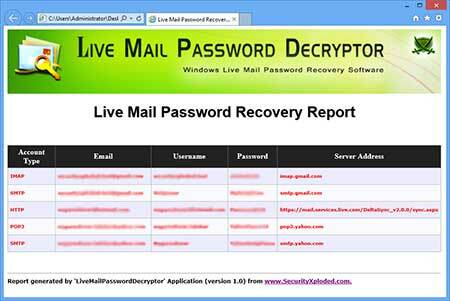 Mega 2016 edition to support Live Mail password recovery on new Windows 10 version. Also put in new Installer for simple installation & un-installation. Fixed the major bug in decrypting Live Mail account passwords in previous version. Fixed the critical crash problem in recovering longer passwords. Thanks to 'Ahmed Benjelloun' for reporting and helping in fixing it. First public release of LiveMailPasswordDecryptor. 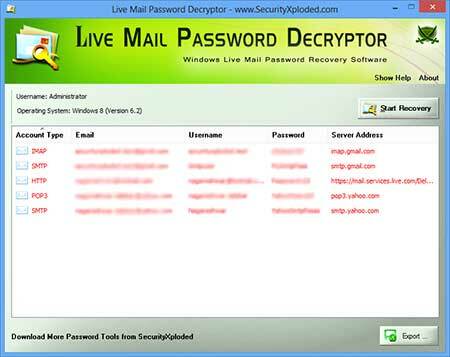 LiveMailPasswordDecryptor is the free tool and designed for good purpose to help users to recover the lost Live Mail account passwords. Like any other tool its use either good or bad, depends upon the user who uses it. However author or SecurityXploded is not responsible for any damage caused due to misuse of this tool.